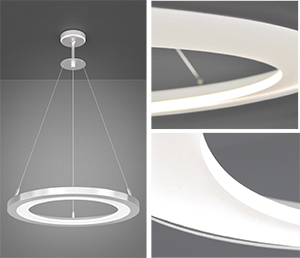 New edge-lit ring pendant fixtures. An edge-lit disk adds a dramatic highlight to Manning Lighting’s new Orbx series of pendants. An LED source hidden in the sleek aluminum housing is designed to perfectly illuminate the light guide, creating a uniform appearance and efficient distribution, with no glare. Available in 24”, 36” and 48” diameter, the LED pendants feature multiple color temperatures, finishes, and suspension options.